This guidance assists sponsors with the process of applying for orphan drug designation of a prescription medicine to receive a waiver of application and evaluation fee for registration on the Australian Register of Therapeutic Goods (ARTG). For information on the eligibility criteria and supporting documentation requirements for orphan drug designation, please see the guidance on eligibility criteria. This text representation of this diagram is provided as a list with numbered steps. Designation is a formal process that allows us to make a decision under regulation 16J of the Therapeutic Goods Regulations 1990 (the Regulations) regarding whether the medicine is eligible for orphan drug designation. The designation application precedes the registration application and is the formal application made using a specified form requesting assessment against the relevant eligibility criteria and a decision from TGA. Application and evaluation fees are waived for prescription medicine registration applications if a related orphan designation is in force (see period of designation ). You can lodge an application for registration of an orphan drug through any available prescription medicine registration process, subject to meeting the requirements for that registration process . An orphan drug designation does not guarantee registration on the Australian Register of Therapeutic Goods (ARTG) . A valid orphan drug designation must be held in order for benefits resulting from designation to apply to a submission for registration on the ARTG. Medicines with orphan drug designation have the same evidence requirements as other prescription medicines and will be evaluated by TGA for quality, safety and efficacy in the same way. Eligibility criteria for the orphan drug program are set out in regulation 16J of the Regulations. See our guidance on orphan drug eligibility criteria for more information. A transition period was in place for orphan drug designations which were made prior to the reform of the program, at a time when their status would not lapse. In accordance with regulation 54 of the Regulations, these designations remained in force for a period of 12 months from 1 July 2017 - i.e. until 30 June 2018, to allow sufficient time for stakeholders to adjust to the new program. Specific transition arrangements were also provided in regulation 55 of the Regulations for those applications for orphan drug designation that were pending at the time the amendments which introduced the new program commenced. Orphan designations under the previous program will remain published on the TGA website but are no longer in force with the end of the transition period. See the Process for orphan drug designation diagram for an overview of the process. You may request a pre-submission meeting with TGA to discuss a planned orphan drug designation application and subsequent submission for registration. These meetings should occur six months prior to the date you plan to submit your registration application (and therefore should occur up to three months prior to lodging your designation application). The content and procedures for these meetings are as per the standard prescription medicines pre-submission meetings process. Details of any pre-submission discussions should be provided in the Pre-submission Planning Form (PPF) and the dossier (Module 1.7.1), as per the usual process. If you already have a client ID number and password to access TGA Business Services (TBS) as a Submitter, go to Step 3. Designation applications are created and lodged by people with Submitter access through the TGA Business Services portal. go to our TGA Business Services: getting started with TGA and submit the online organisation details form. We recommend that you submit your application for designation three months prior to the date you plan to lodge your submission for registration. You can access the designation/determination application e-form through your TBS account. See the designation/determination application e-form guidance for further guidance on filling out the form. Please see the eligibility criteria and supporting documentation guidance for information on meeting the eligibility criteria and the requirements for supporting documentation to be attached to your designation application. For any attachments, use the format outlined in Part A and Part B of the General dossier requirements for prescription medicines. If the active ingredient(s) is not on the approved list, you can submit a proposal for a new ingredient name to the TGA before, or in parallel to, your application for orphan drug designation. Use the proposed name (AAN/ABN) in the application form for orphan drug designation, including the word 'proposed' in brackets after the name. Note: Applications for orphan drug designation cannot be finalised until an approved name has been allocated to the active ingredient(s). There is no fee for an orphan drug designation application. You will need to pay the determination application fee if you are submitting an application for orphan drug designation at the same time as an application for priority determination or provisional determination. This fee will be refunded if your orphan drug designation is approved. See the priority determination or provisional determination step-by-step guidance for more information. We will assess your designation application and make a decision as quickly as possible. After you have submitted your designation application using the e-form, we will check the information provided and confirm whether it is sufficient to allow us to assess the application. includes supporting data and references where required. We will not formally notify you of the results of this checking process, however, you may receive requests for further information. If you have any questions during the designation application assessment period, please contact AET.Application.Entry.Team@health.gov.au. We will review your application for designation against the eligibility criteria set out in sub-regulation 16J (3) or (4) of the Regulations, depending on whether you have applied for a medicine that is not a new dosage form medicine or a medicine that is. The focus of our assessment is to determine whether the application and supporting documentation establishes that the eligibility criteria are met. We may seek independent expert advice on aspects of the assessment if required. 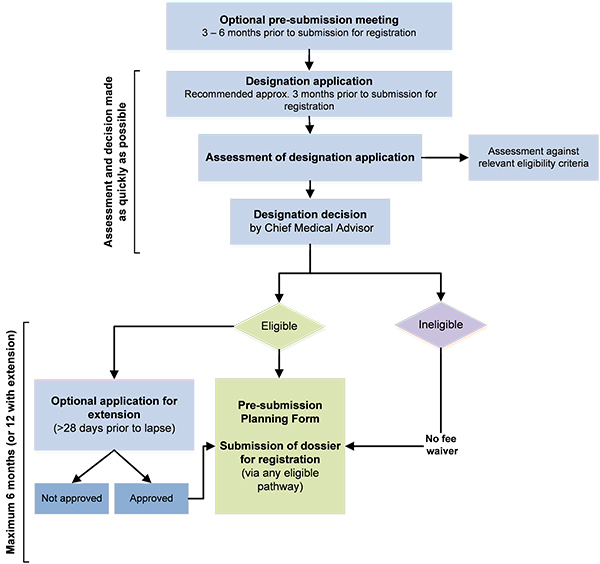 A recommendation from the relevant Clinical Evaluation Unit will be referred to TGA's Chief Medical Advisor, who is the delegated decision-maker for orphan designation applications. We may request additional information or clarification from you during the course of our assessment. These requests will include a timeframe for response which is determined on a case-by-case basis, and details of TGA contacts for your response. The usual time frame for your response will be approximately five working days. You are responsible for providing evidence in support of your application. Any time taken for you to respond to requests will extend the overall assessment and decision-making timeframe. If no response is received in the specified time period, TGA will make a decision based on the available information. You may withdraw your designation application at any time before we notify you of our decision. To withdraw the application, email AET.Application.Entry.Team@health.gov.au. the proposed indication for designation. We will not publish on our website details of applications for determination that are withdrawn before the decision is made or are assessed as ineligible for determination. If we assesses that your application for designation meets the eligibility criteria, the medicine will be designated as an orphan drug. After we have made a decision, we will advise you via email of the outcome as soon as practicable (see sub-regulations 16J (6) and 16J (7)). details of your appeal rights. The orphan drug designation decision is appealable under Regulation 48. Appeals regarding designation decisions must be lodged within 90 days of the designation decision being issued. Further information on how to seek internal review by TGA or external review by the Administrative Appeals Tribunal is available on our website. If an orphan drug designation is approved, we will publish details of the eligible designation decision on our website (subregulation 16J (5)). Designation decisions will be published as soon as you have been notified. We will not publish details of designation applications that are assessed as ineligible or those that are withdrawn before we make a decision. Your orphan drug designation comes into force when it is made and remains in force for six months (refer sub-regulation 16K (1) of the Regulations) unless it is extended or revoked. The period during which the designation is in force is not affected by lodgement of a related registration application. Note: Applications to the Pharmaceutical Benefits Advisory Committee (PBAC) link to the TGA orphan drug designations for certain fee waivers to apply. Sponsors intending to make a concurrent or subsequent application to the PBAC should consider the implications of any orphan drug designation ceasing to be in force, prior to any such application. If you are unable to lodge your submission for registration within the initial six month period of validity, you may apply to TGA in writing for one extension of your orphan drug designation only. Approved extensions will be granted for a further six months, as set out in sub-regulation 16L (1). Applications for extension of orphan drug designation must be lodged in the approved form using the designation/ determination extension application eForm on TGA Business Service at least 28 calendar days before the designation lapse date. Applications made less than 28 days before the designation lapse date will not be accepted for assessment (see sub-regulation 16L (2)(b)). See our guidance on completing a designation or determination extension application form in TGA Business Services for more information on filling out the form. An orphan drug designation cannot be extended if TGA has previously extended the designation (sub-regulation 16L (4)(a)). There is no fee for applications to extend orphan drug designation. Similar to the original designation application, we may request additional information or clarification from you throughout our assessment of your designation extension application. assessment is against the eligibility criteria set out in sub-regulation 16J (3)(e and f) or 16J (4) (d and e) of the Regulations, depending on whether you have applied for a medicine that is not a new dosage form medicine or a medicine that is. We will notify you of the outcome of your application for extension via email as soon as possible after the decision has been made by TGA. Approved extension letters will include details of the extended orphan drug designation period. If your application for extension is not approved, you will be provided with a statement of reasons for the decision. Decisions regarding a refusal to extend an orphan drug designation can be appealed under Regulation 48. Only one extension will be granted per orphan drug designation. TGA reserves the right to revoke the designation prior to the end of the designation period under Regulation 16M. the Secretary is satisfied that the medicine no longer meets the relevant eligibility criteria (either new dosage form under sub-regulation 16J (3), or non-new dosage form under sub-regulation 16J (4)). However, we will not routinely review designation decisions during their validity. If we decide to revoke your designation, we will advise you of the decision and the reasons for the decision in writing as soon as practicable. Decisions regarding revocation of designations can be appealed under regulation 48 of the Regulations. If you wish to obtain the orphan drug fee waiver and your designation including any extensions have lapsed, you must submit a new designation application. We will re-assess the new designation application against the eligibility criteria, as some aspects such as ‘comparison against existing therapeutic goods' may have changed since the original designation decision was made. You are required to provide the reference number/s for previous designation applications in your new application for designation. If you have read the guidance and still require assistance, contact: AET.Application.Entry.Team@health.gov.au. An application for registration of a designated orphan drug can be lodged through any of the available prescription medicines registration pathways . Guidance on submitting your PPF is available on the TGA website. To be eligible for a waiver of registration fees a related orphan designation for the medicine, indication, dosage form and sponsor must be in force when the relevant fee is payable. The application fee is payable at the time of making an application for registration and the evaluation fee is payable on the day on which the applicant is notified of the amount of the evaluation fee (following preliminary assessment). Fees are payable if the orphan designation for the medicine has lapsed, or the application is outside of the scope of the orphan designation (e.g. indication or dosage form). There is no requirement for an orphan drug designation to be renewed. You may apply for a new orphan designation at any time if you wish to do so. Consider our guidance eligibility criteria and whether you still address all criteria prior to lodging an application. Note: Fees for minor variations to the registration of a medicine (i.e. regulatory activities under section 9D of the Act) cannot be waived for an orphan drug. Submissions for registration that combine applications for which an orphan designation is in force with applications for which no orphan designation is in force will not be eligible for a fee waiver.